Extraordinary waterfront oasis, a little piece of heaven on earth! Offering stunning water views across the Rappahannock River. 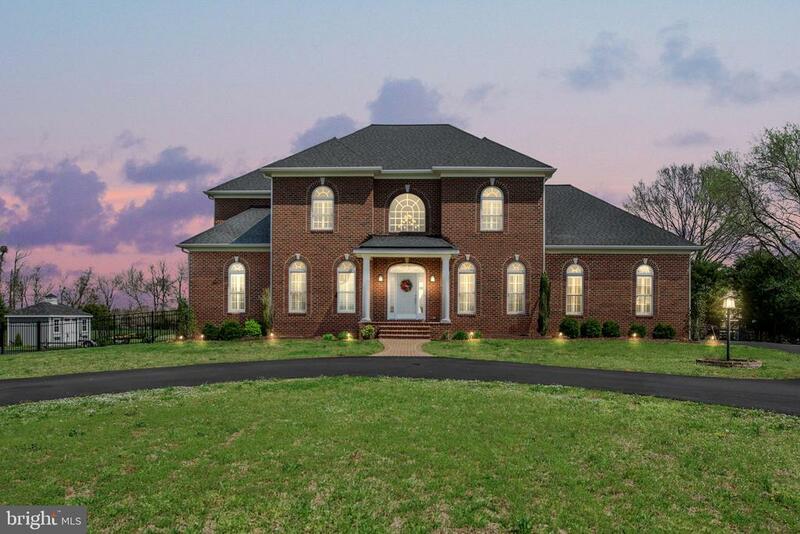 Custom built all brick Colonial on 3.44-acres directly across from the Rappahannock River Valley National Wildlife Refuge. Enjoy majestic views from the chefs kitchen with Silestone counters, enormous island with seating for 6 or more, Wolf 5 burner gas range with hood, stainless steel appliances, butlers pantry & beautifully tiled floors. Relax in the comfort of the spacious family room by the see-thru gas insert fireplace with exquisite Hearth, taking in the breathtaking river views through the floor to ceiling windows. Retreat to the comfort of the Master Bedroom with trey ceilings, warm hardwoods, wet bar, see-through gas insert fireplace, custom Master Bathroom with oversized jetted tub. Wake up every morning to incredible water views right from your own private sitting area. Entertain family & friends on a stunning all brick open terrace and covered porch, perfect for gatherings or watching the sunset. Take a cruise on your boat down the river enjoying water sports, jet skiing, paddle boarding, kayaking and fishing as you experience the Osprey nesting and bald eagles diving to catch fish. Park your Bass or Pontoon boat in the private covered boathouse equipped with an electric lift, 2 lifts for jet skis and attached kayak or paddleboard holders. Have afternoon lunch on the dock or enjoy an evening watching the sunsets or morning sunrises. The full basement offers fantastic storage or room to expand your living space. Easily access all three floors with your Savaria elevator. Host the Holidays or Entertain family and friends for some summertime fun with 4 large bedrooms upstairs with Jack and Jill bathrooms. Let the little ones or family pets play in the wrought iron fully fenced in back yard with multiple gates or take advantage of the wildlife refuge with easy hiking & views right across the street. Centrally located in Port Royal 25 miles outside of Fredericksburg, 17 miles from the Massaponax VRE, 16 miles from Dalghren and about an hour each to Richmond or DC. Directions: From 95 in Massaponax. Turn right onto US-17 S for 19 miles, turn right onto US-301 N for .7 miles, turn right onto Caroline St. for .3 miles, home on the left.